/ What’s the bell icon on my Gmail window? What’s the bell icon on my Gmail window? 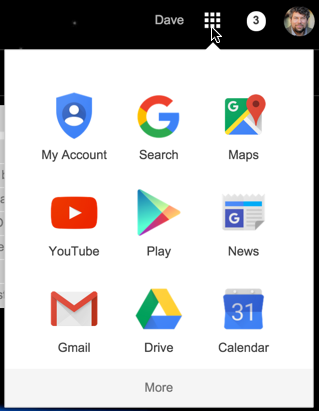 I’m a bit confused: on the top right of every screen of my Google Mail [Gmail] account I see a small white circle with a black bell in it. What exactly is that and what’s its purpose? If you’re a Facebook user, however, you’ll be envious by the time you finish reading this post, because Google has smartly integrated Google Plus into every other Google property. In fact, it’s all neatly stitched together so if someone leaves a comment on one of my YouTube videos, for example, I’ll see it in this status window too, which is about 100x more useful than me having to go to YouTube to find out what’s going on. See that bell? Yeah, nothing’s happening, so it’s just, well, a bell. Not very interesting at all. It’s worth checking out “My Account” if nothing else because you can double check that your security and privacy settings are as you want. But that’s the subject of another post! Now you can see, it’s Christian’s entire comment, and even an input box where I can respond with my own comment. If I hover the cursor over the timestamp an otherwise hidden “+1” button shows up too, the Google Plus equivalent to the Facebook “like”. All here within this pop-up window, with whatever I’m doing on Gmail (or any other Google property, as it turns out) still just sitting there, ready to go when I’m ready to return to it. 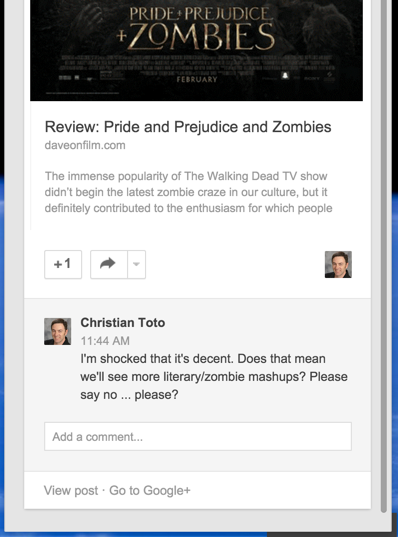 Note even here it’s useful: you can click on “Previously read” and go back to review all your other engagements and interactions on Google Plus. Again, all within this pop-up window. 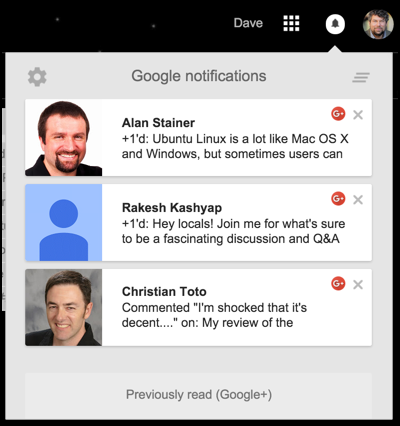 It’s one reason I really like Google Plus. 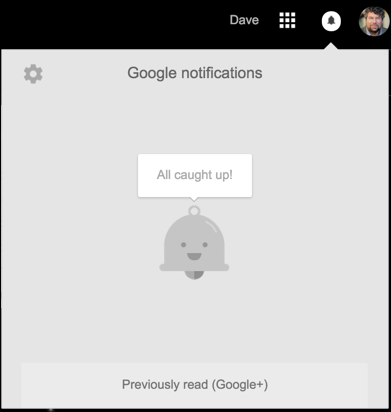 I really appreciate the ability to stay focused on what I’m doing in Gmail, Google Maps, Google Docs, whatever, and swoop in quickly to see what’s going on with my Google Plus (and YouTube) account, then jump right back. Super easy. Hope that helps explain things. 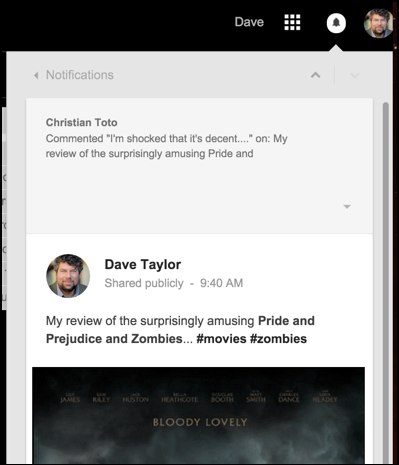 See ya on Google Plus! The bell icon is used as notifications, like if some subscribed to you on youtube or you got a new E-Mail.